If you have a personal injury lawsuit in Miami, sooner or later you will likely end up in mediation. So what is mediation? It really doesn’t involve deep measured breaths, closing your eyes and focusing inward (although that might help during an actual personal injury mediation). Florida law and Rules of Civil Procedure provide for and encourage settlement of all legal disputes. The primary format for alternative dispute resolution in Miami is called mediation. What is a Personal Injury Mediation? Mediation is a basically a settlement conference with an impartial third party called a mediator who is trained and certified. It usually takes place at a neutral location like the mediator’s office. The parties to the lawsuit attend with their lawyers. Often in personal injury mediation, there is an insurance company involved. The insurance company will usually have a claim representative or adjuster attend the mediation with the insurance defense attorney. Some insurance companies will have designated field representatives who attend all the mediation conferences in the particular jurisdiction. On other occasions, an adjuster will attend the mediation by phone or Skype. In order to attend by phone or Skype, the parties would need to agree. If the parties do not agree, then a motion to allow the adjuster or representative to attend by phone can be filed with the court and a judge can rule on the issue. Typically in a Miami personal injury mediation, the parties will agree to allow the insurance company representative attend by Skype of conference call. What Type of Personal Injury Case Goes to Mediation? After litigation begins, the parties to the lawsuit can agree to settle a case at anytime. If the case is set for trial, then it will need to be mediated first by court order. Personal injury attorneys often look at mediation as the “ticket” to a jury trial because if a case is not mediated or the judge has not specifically ruled that mediation is waived, that case will not go before a jury. It is extremely rare for a judge to waive mediation. It makes sense too. 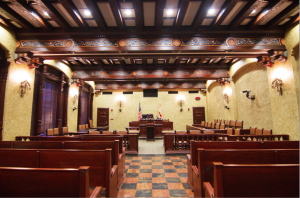 Plaintiffs, defendants, attorneys and insurance adjusters will all posture themselves as wanting a jury trial as a way to gain a perceived advantage in negotiation. Most judges have heard it all before and after listening to all the bluster, still send everyone to mediation because about 80% of mediated cases settle. How Does the Mediation Happen? A mediation usually starts with the mediator greeting the parties and lawyers. The mediator then explains why everyone is there; what will happen; and why it is important for everyone to put their best efforts into reaching a settlement. After the mediator’s opening statement the plaintiff’s lawyer will make a statement setting forth the plaintiff’s case. Next the defense attorney makes opening remarks. After all the opening presentations are done, the parties and their lawyers split into separate rooms. Then the mediator begins to earn their money with “shuttle diplomacy” between the rooms. A good mediator will listen to both sides and to a degree, play devil’s advocate. It is the mediator’s job to get all parties to understand not only the strengths of their cases but the weaknesses as well. It is through this process, that a settlement can be achieved. Experienced mediators and personal injury lawyers will agree that most good settlements leave everyone a bit dissatisfied. But at the same time, the resolution of the case and the terms of the settlement were something everyone involved could live with at the end of the day. One of the main reasons to settle a case is one of control. By agreeing to a settlement, the parties control the outcome. If a case does not settle and ends up before a jury, then the result is in the hands of a jury and that is unpredictable and to many people, unacceptable. At the Wolfson Law Firm in Miami, our wrongful death attorneys and personal injury lawyers have attended mediation settlement conferences with our clients since 1963. We are available to answer any questions that you might have in regard to the mediation process. Just contact us at (305) 285-1115 for a free consultation.